Individuals across Wrexham looking to work in the childcare sector are being invited to apply for a new programme which encourages people to consider a career in the industry. 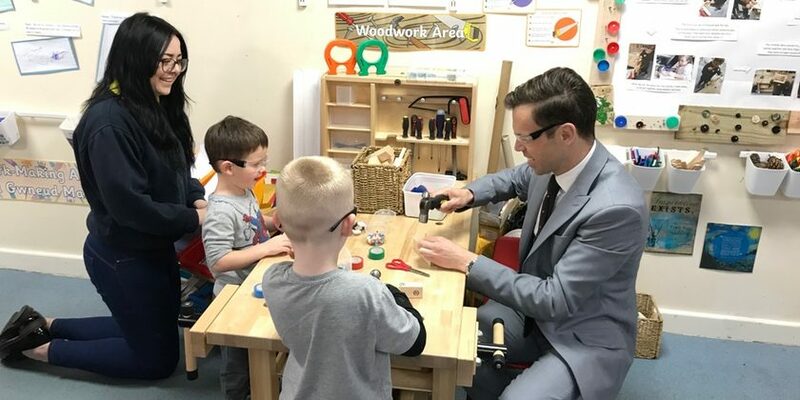 Childcare Works phase two will be delivered by the National Day Nurseries Association (NDNA) Cymru and will train up to 84 people aged 25 or over, providing them with supported employment placements in a nursery for 16 weeks. The Welsh Government funded programme will run until December 2020, with work placements at nurseries in ten local authority areas – including Wrexham. NDNA Cymru is now seeking participants who are currently not in employment or education but who are interested in taking part in the project to apply. It follows the successful Childcare Works phase one in Flintshire and Wrexham, which trained 16 participants over the age of 50, most of whom have gone on to secure permanent employment within the early years and childcare sector. Sarah Griffiths, nursery manager at Hill Tots Nursery Brymbo which took part in phase one of the programme said the NDNA Childcare Works scheme is a “win win situation”. “It effectively gives nurseries a 12-week interview process and those 12 weeks are valuable,” explained Sarah. Economy Minister Ken Skates encouraged those eligible and aspiring to pursue a career in childcare to apply for the scheme. “Childcare is an essential part of the Welsh economy, providing a vital service in a foundational sector and ensuring our communities and the Welsh economy can prosper and parents and carers can access employment and training. “This project is one of a number of ways we, the Welsh Government, are looking to support investment into the childcare sector, supporting the sector to grow and become sustainable. “We want to attract individuals with the right skills and personal attributes for working with young children to pursue a career in childcare. “With the success of phase one showing that given a little help and the right training opportunity, it can lead to starting a rewarding longer term career. The Childcare Works project is one of the actions Welsh Government is developing under its 10-year Childcare, Play and Early Years Workforce plan. The plan aims to professionalise the sector and encourage high quality new entrants. The Childcare Works project aims to give participants a chance to learn new vocational skills, in a supportive environment enabling them to take up further training, or an apprenticeship and pursue a future career in the early years and childcare. It also supports the Welsh Government’s Employability Plan, launched last year to support people into work now, while preparing the workforce for immediate and long term future challenges. Purnima Tanuku OBE, chief executive of NDNA, said: “We are really pleased that the Welsh Government has given us the opportunity to roll out the Childcare Works project across the country. “This project encourages people to consider a career in early years and childcare whilst undertaking practical work placement opportunities within the sector. Participants are given ongoing support, providing a valuable skills platform for those wishing to embark upon a career within the childcare sector. If you are interested in participating as a nursery trainee, and you live in any of these local authority areas, go to ndna.org.uk/childcareworks or ring the NDNA Cymru office on 01824 707823.